Transformational Decor - By Ruchita Pathak, My Wedding Planning. Our clients, Ishaan and Pratiksha got married at Radisson Blu Goa this March. 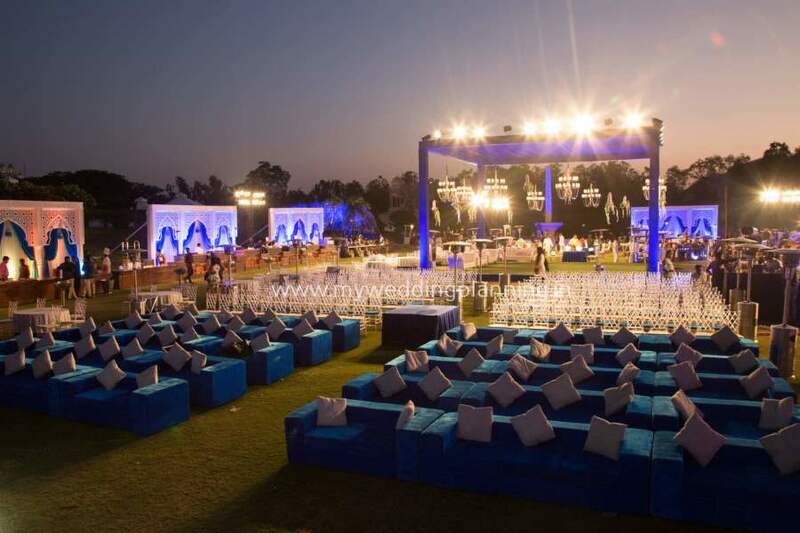 As there are sound restrictions beyond 10 pm for an outdoor event, they choose to have both their evening functions namely the sangeet and reception indoor at the banquet hall. 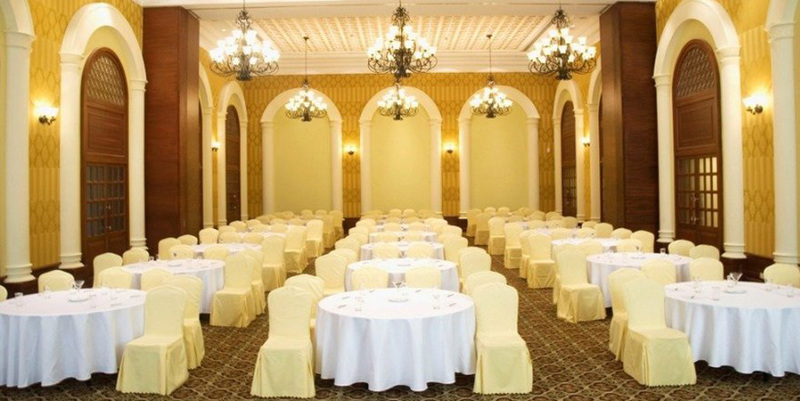 Radisson has only one ballroom that can hold a capacity of 300 guests and hence we were left with no choice but to use the ballroom for both the big events on both nights. 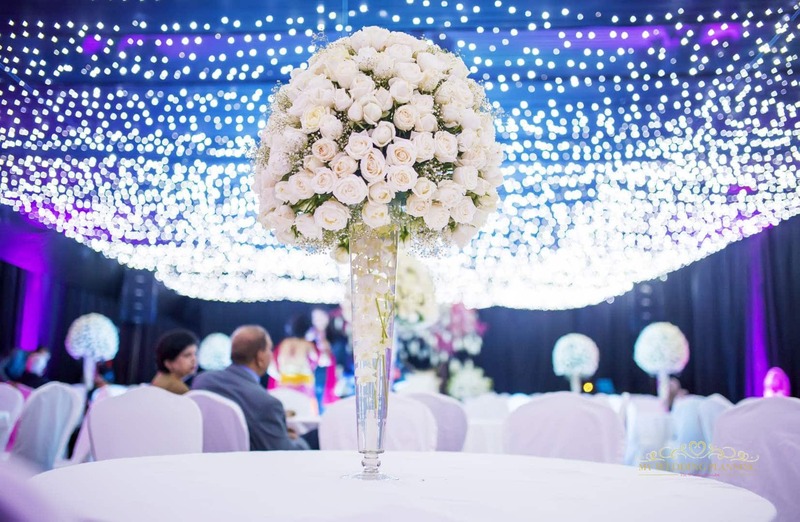 Though Radisson’s ballroom is a stunning venue with pretty chandeliers and tall celings, Ishaan and Pratiksha were adamant they wanted a totally different ambience on both days. We promised them that we would make it feel like a totally different venue for both nights. Challenge : To design and execute a theme which completely transforms the way the ballroom looks for the wedding reception. We advised them that if you want to turn your venue into another world, choose a strong theme on the first night and change the theme on the second night. After a lot of deliberation, we opted for ‘Hollywood meets Bollywood’ theme for the sangeet as Ishaan is from London and Pratiksha is a desi girl! Here we went all out with a filmy Bollywood inspired stage, custom made movie posters of the bride and groom, lots of movie world accents like film reels, VIP entrance with barricades, red carpet entry and photo opportunity booths. 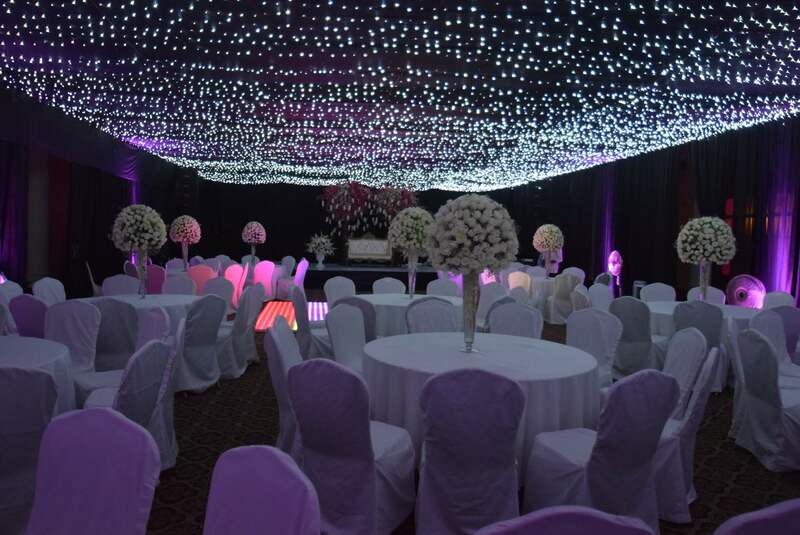 We provided full room draping, carpeting throughout and mood lighting as well for added effect. Radisson’s ballroom is beautiful in itself and these enhancements made our theme come through on the first night. We realized that making the reception completely different from the sangeet is going to be a major challenge. The venue needed a total revamp and major face-lift if it had to be totally transformed! From our design experience, we realized that the only effective way of doing this was by opting for gorgeous allover lighting. That is when we convinced our clients for a ‘Starry Night’s Theme’! We are talking of thousands of twinkling lights on the celing enveloping the entire space and giving a flickering glow. Now this is a wow-worthy look! Once the room itself was lit, we highlighted a few spots within the reception with cherry blossoms and tall centerpieces to bring even more drama. A big and bold installation featuring their monogram was placed at the entrance as a fun focal point. Bonus: It could double as a background for your photo booth. To transform your wedding you can connect with us at : Contact us.